Products are items that can be purchased by members. Examples of products may include registration fees, playing gear, merchandise or event tickets. Products are closely tied to the Registration Form module, as products are the 'items' that can be added to a registration form to be sold online. 1. From the Association or Club level of the Membership database, click on Registrations in the menu and select Products from the drop-down menu. 2. The Products screen lists all existing products in your database (if any). If products have been assigned to a group (eg. player registrations, merchandise or events) they will appear below their group heading in the list. The product list can be filtered by group using the 'Records for group' drop down list and can also be filtered by their active status ('active', 'inactive' or 'all') using the 'Showing' drop down list. 3.Fill out the tabs across the top of the product where necessary. Compulsory fields include, Name, Product Type and Payment Split. The first tab in the Add/Edit Products screen is 'Details'. This screen will allow you to change the basic details of the product. Name: This will be the name of the product that you create (for example, 2015/16 Junior Registration Fee). Product Reporting Season: The season that product is for. So if it’s for your summer season or the 2015 season, select it in this drop box. This will assist in reporting on which products were purchased in which season. Archive Product: Product will be set as inactive. It will still be in your database, it won’t be deleted. 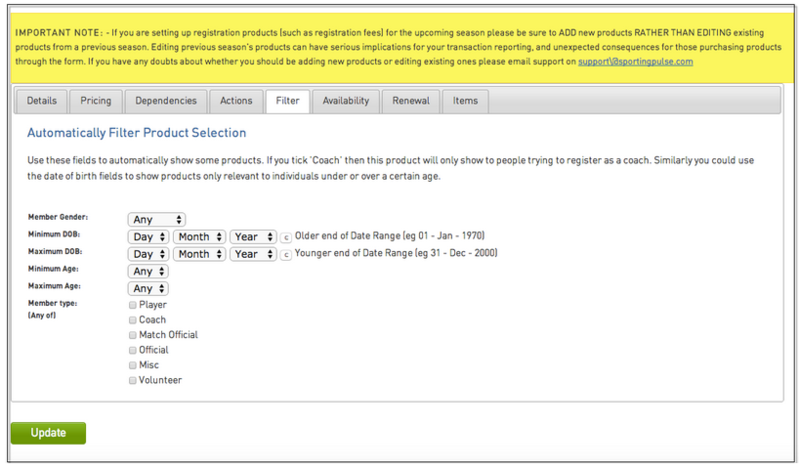 To find it, you will need to filter your products by ‘Inactive (Archived)’ on the Products Page, as shown below. Grouping Category: This will allow your products to be grouped together on your registration form, as shown below. Allow Multiple time purchasing: This will allow a product to be purchased on more than one occasion, so a member can log in to the form in March purchase the product, then come back in say June and purchase the same product again. Allow Multiple quantity purchasing: This will allow a quantity of more than one to be purchased. So if for example, a member is purchasing merchandise they can enter in the number of how many products they like to purchase. Notes: This will allow you to include a note on a Product. The second tab on the Add/Edit Product screen is 'Price'. The pricing tab is where to set up the payment structure of your Products. Minimum System Login to change price: The level at which the price of the product can be changed. If for instance an association sets up a product and sets the minimum system login to change price to ‘Association’, the clubs beneath the association won’t be able to change the price of the product. Minimum System Login to sell product: The minimum level at which a product can be sold. Single Pricing: Price of the product if single pricing is selected. Multiple Pricing: The multiple pricing system, where first adult/child price is the cost of the first purchase, second adult/child price is the cost of the second purchase etc. For example, the pricing scheme below would see the first child charged $50, second $40, third $30 and the fourth and all subsequent registrations would be $15. Payment Split: Where is the money going? The two common options are to the Club or Association. The third tab Add/Edit Products screen is 'Dependencies'. Mandatory Products: This will allow you to set another product you have set up as mandatory when this product is purchased. So for your Registration Fee for example, if you charge a joining fee as well (and its set to mandatory), when the Registration Fee is purchased the joining fee will be automatically purchased. To make a product mandatory simply tick the appropriate product in the box. The fourth tab in the Add/Edit Products screen is 'Actions'. This menu will allow you to set what takes place once a member purchases the product. 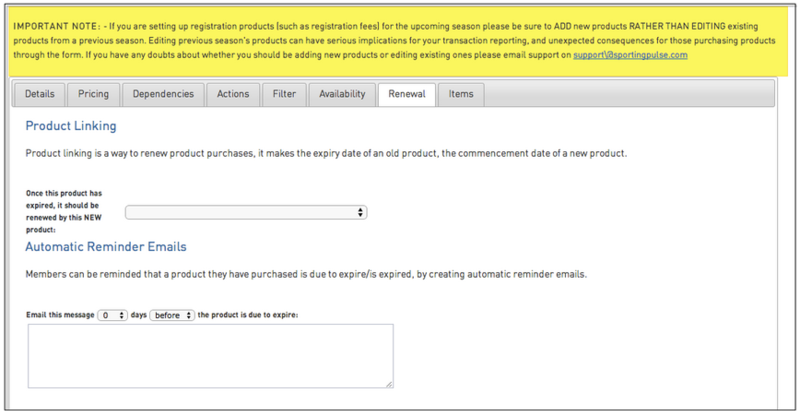 Set Product Expiry: This sets a date for the product to become inactive on the member’s record. Set Player Financial: Tick this box if you’d like the member’s status to be marked as ‘Financial’ for the season after purchasing this product. Set Coach Financial: Tick this box if you’d like the coach’s status to be marked as ‘Financial’ for the season after purchasing this product. Set Match Official Financial: Tick this box if you’d like the match official status to be marked as ‘Financial’ for the season after purchasing this product. Set Season Member Package: This is only applicable if a member package is available. Set Member Registered Until: Set a date, or number of days from registration, that the member will be registered for. The fifth tab in the Add/Edit Product screen is 'Filter'. This menu will allow you to filter out which members the product will appear for. Member Gender: Set this, for example, to ‘Male’ if you’d like products to only display for males, ‘Female’ to display only for females. Member type (any of): If you’d only like your products to be available to Player or Coach tick the relevant boxes. This relies on your members ticking the relevant boxes (i.e. Player/Coach etc.) on the first page of the registration form. 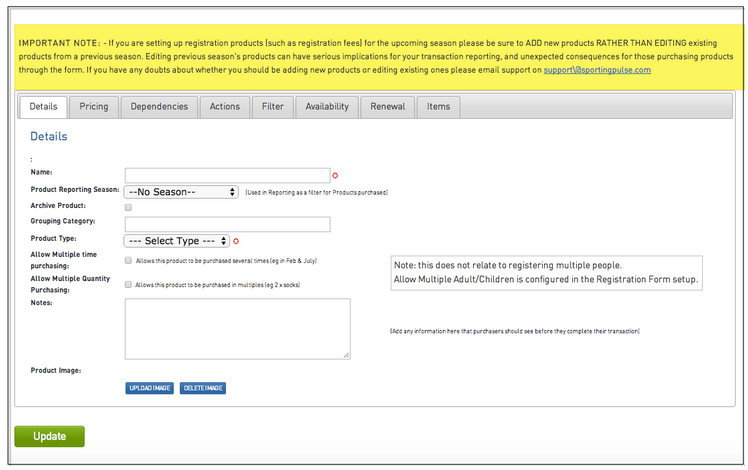 The 6th tab on the Add/Edit Products screen is 'Availability'. The Availability tab allows you to display the product on the registration form for a set period of time. For example, tickets to a club's Presentation Dinner may only be available for purchase up until 1 week before the event. Adding an end date (next to 'Product Available To') will automatically take the product off the registration form on that date, rather than having to remember to log in and manually take the product off the registration form on that date. 1. Add the start and end dates using the fields provided. 2. Click on Update to save the availability dates. The 7th tab on the Add/Edit Products screen is 'Renewal'. The Renewal tab is an option designed for advanced users with very specific requirements relating to the renewal of player/ team registrations. The Renewal tab allows you to set up a certain product (eg. Product A) to be superseded by another product (eg. Product B) upon its expiry date. Emails can be set up that notify members that have purchased Product A that it will be expiring soon and Product B is available for purchase. 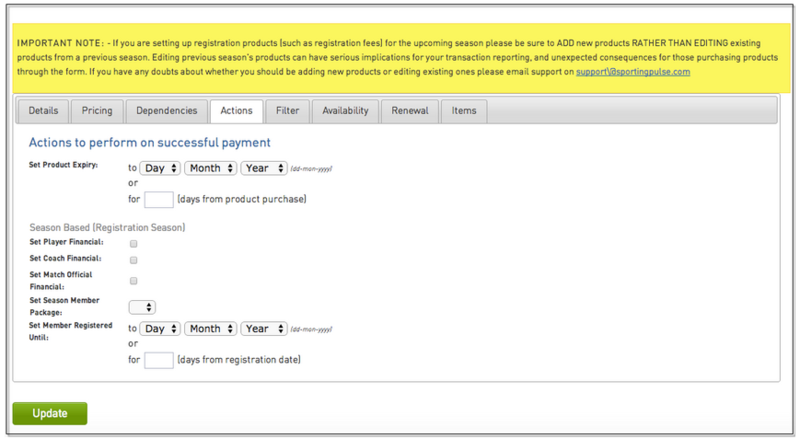 Seasons must be allocated to products used in the renewal process (via the Details tab) in order to make players financial for the registration season. The 8th tab is the Items tab. This gives users the ability to ask for additional information on a specific product.